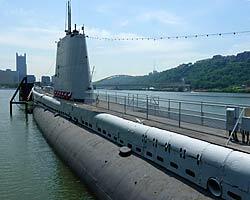 You can visit the Submarine USS Requin at the Carnegie Science Museum in Pittsburgh, PA. This submarine is an American Tench class fleet submarine which was completed too late to see action during WWII. Originally the USS Requin was configured with 8 torpedo tubes - 6 forward and 4 aft and with 2 five inch deck guns. 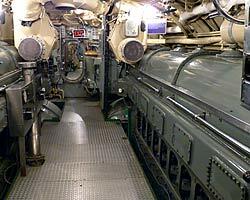 When it was converted to Fleet Snorkel Configuration the aft torpedo tubes were deleted and the aft torpedo room became the Stern room which was used as a CIC (Combat Information Center. The submarine has been very well restored. 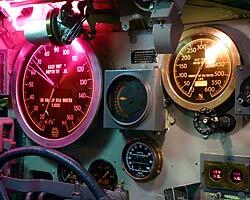 In the forward torpedo room the majority of the equipment is still in place. 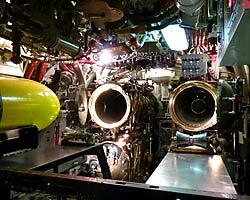 One of the torpedo tubes is open and lit giving you a good view of its interior. Looking up to the ceiling you'll see the Escape Trunk, a compartment that could be flooded and drained in order to allow crewmen a chance to escape should the sub sink to the bottom. It is very well lit and you can get a good look inside. The officer's quarters and Captain's Cabin are well equipped with period items and what looks to be pieces donated by a former captain of the sub. The Wardroom is in extremely good shape and looks like it had been freshly reupholstered. The amenities of for the officers are spartan by civilian standards but heads and tails above that of the enlisted crew. The control room has been nicely restored with many of the instrument and other panels properly lit up. Handles on critical valves have been removed or locked to prevent the kiddies performing an unplanned dive in the river. The conning tower is off limits and its hatch is closed so you cannot get a view of the submarine's periscope. The engine rooms are both very well done and in the aft engine room one of the Fairbanks Morse diesel engines has its cover off and you can see the massive connecting rods bolted to its crankshaft. The controls in the Maneuvering Room seem simpler and less cluttered than those of Gato Class Fleet submarines (this is the Tench Class). 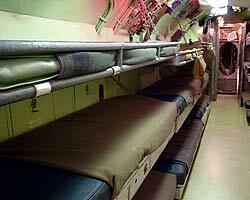 Many of the crew's bunks are still in place and give the visitor a feel for just how cramped a WWII era Fleet Submarine could be. Remember, these are "Hot Bunks", where each bunk is shared by more than one sailor and were swapped as each sailor went on or off duty. 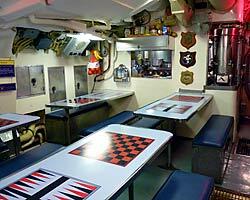 The Galley and Crew's Mess look great and the original tables and benches are still in place. I got a laugh out of the Jukebox. 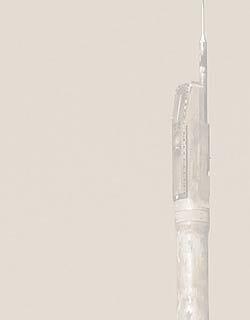 It's the first I'd seen on a museum submarine. 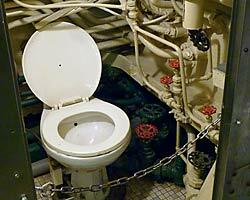 The USS Requin's heads (toilets) are both tight and an contained an overwhelming series of pipes and valves and fittings. I'm not sure how many of them you had to actuate to flush the bowl. Although stairs have been cut into the hull fore and aft to improve visitor access, the USS Requin is not handicap accessible. Visitors should be able to manage stairs and step over high thresholds at several watertight doors throughout the boat. Food is available in the Carnegie Science Center and there are a couple of fast food places a couple of blocks up the street. 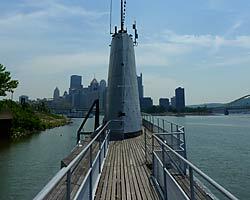 Admission to the submarine is a part included in the Carnegie Science Center admission tickets, but you can buy tickets for the USS Requin tour alone for a much reduced rate. 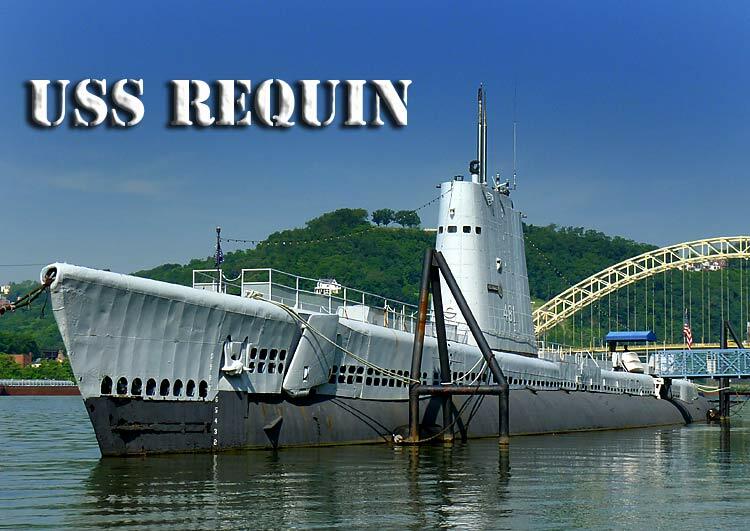 Visit the USS Requin Museum Website for information on hours and directions.